John loves Grace and her 10-year-old son, Zachary. Although he wants to propose to her at Christmas, it’s the one holiday John runs from. In this romantic comedy, chaos with exes, misunderstandings, parents and in-laws all imperil John and Grace’s relationship. But can they get it sorted out in time for the holidays? I LOVE this movie!! It is a modern scrooge type movie complete with hysterical incidents that eventually turns the hearts of several to cheer, warmness, and joy. In my mind it is right up there with the top classical Christmas movies. It has an original story, one that I would love to be able to show year after year to family and friends. Please make this available on DVD. I LOVE this movie. It’s a heartwarming movie which is what I want in a Christmas movie. Excellent in my opinion, and I also love Sergio in Flashpoint. He exudes such a friendly and caring nature. I wish it was available on dvd. it was not a good movie, actually quite annoying and disappointing. 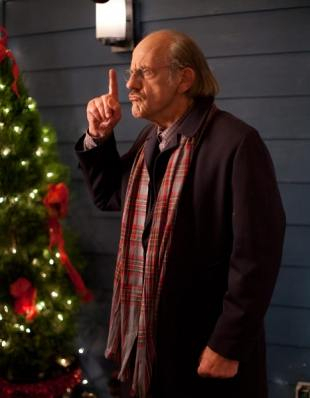 Anything But Christmas stars Sergio Di Zio, Elaine Hendrix and Christopher Lloyd…and I can’t wait to see it!